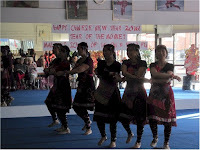 Chinese New Year is this Saturday, January 28. 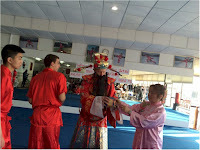 It's a holiday I became familiar with a few years ago when I started studying tai chi at a tai chi/kung fu school. The school celebrates Chinese New Year (though not on the official holiday the last couple of years) with performances and entertainment. Cai Shen visits to distribute red envelopes. 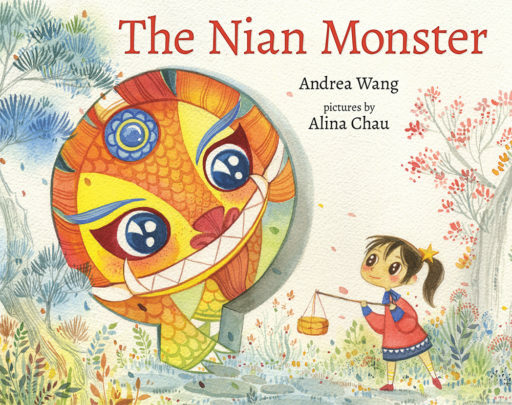 The Nian Monster by Andrea Wang with illustrations by Alina Chau is a beautiful book about this very holiday. In Chinese culture, the story of the Nian Monster is a sort of creation story, explaining how the color red, music, and fireworks became associated with the New Year celebration. In Wang's The Nian Monster, the monster is no longer frightened by the old tricks from a thousand years ago and has returned to devour modern Shanghai. Unfortunately for him, the first human he encounters is a young girl named Xingling. She is not at all intimidated and puts him off three times with treats of food that overwhelm him, meaning Shanghai is safe for another twenty-four hours until he recovers. She vanquishes him finally. Will he be back next year? Xingling has a plan to deal with that. The great interaction between Chau's illustrations and Wang's text. We know this is a contemporary story from those illutrations. Xingling enlists the help of adults with each of her schemes to control and overcome the Nian Monster. But she is in control. The grown-ups merely carry out her plans. A lot of what they do is carried in those illustrations I've been talking about. This is an adventure story, not an instructive one. Yet it's difficult to believe a reader will forget the significance of the Nian Monster for Chinese New Year and Chinese culture. While this is a holiday book, the story is so strong and interesting it should be a good read all year long. Want A Copy Of "The Nian Monster?" Doesn't this book sound great? Don't you wish you had a copy? Well, I do have one, and I'm going to give it away. You have all this week to leave a comment below. Something like "I'd like that" or "Count me in." If you're familiar with how shopping for LuLaRoe works, I'm talking something like that. The winner will be announced Friday afternoon after my computer guy uses a program to select a random winner. FTC Disclosure: While I am acquainted with Andrea Wang through Facebook, I purchased my copy of The Nian Monster. Thanks so much for the lovely review, Gail! Happy Chinese New Year! Xin Nian Kuai Le! I agree with this wonderful review!! This is an awesome book with such a strong heroine! I'd love a copy, would be a great addition to my library's collection! Some of our Chinese New Year books are looking a little dated. Count me in. The cover is so inviting! Thanks for highlighting this book! It looks like a great addition to the #kidlit book world. Congrats Andrea & Alina on a beautiful book. Thanks for highlighting it, Gail! Good luck with future giveaways.